Hi. We are Scooter and Grace. The official "surrogate" Mom and Dad bunnies for many of the wounded rabbits who come to SaveABunny and need healing. Hi! My name is Scooter. I am one of the cutest, most entertaining rabbits you'll ever meet. I'm also a sanctuary rabbit at SaveABunny. I live here permanently with my bunny wife, Grace. Grace is one of the most special, loving and nurturing rabbits you will ever meet. She takes very good care of me and the bunnies that we sometimes help to heal. We are protective and welcoming to rabbits in need and help them feel safe. I am an "ambassador" bunny for SaveABunny. I visit schools and nursing homes as a therapy bunny, as well as help the people at SaveABunny educate the public and shelter staff about the proper care and unique needs of companion rabbits. About 4 years ago, I arrived at SaveABunny as a "special needs" rescue. I had been left in the night drop box at Oakland Animal Services with a badly broken leg. SaveABunny is unique as a rescue group in that they are frequently the only group that will take in a special needs rabbit like me. Special needs rescues require both a lot of fundraising (YES! You can donate to help.) and also the interest and commitment to provide long-term emotional and physical healing if needed. Cute, adoptable bunnies are easier to place in homes. 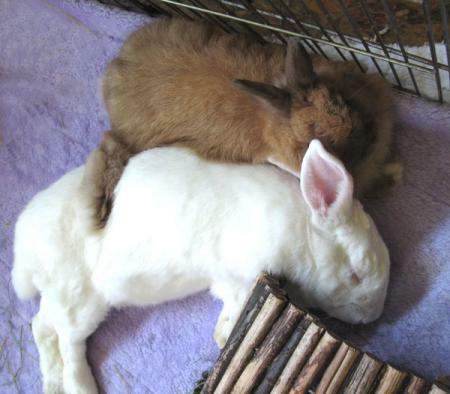 Adopters and medical foster homes for special needs rabbits are always urgently needed. My leg is healed and now it sticks out to the side like a little bunny kick-stand. It doesn't bother me at all and in fact, I move pretty darn fast! It just adds to my charm. Besides being absolutely adorable and endearingly mischievous, one of my jobs at SaveABunny is to help kids (and grown-ups)learn about the importance of kindness and compassion. When I visit with kids, everyone has a chance to feel my soft ears and play with my long fur. I genuinely LOVE to get kisses from all the kids. Some of the kids we meet have physical challenges or may be deaf, blind or have multiple challenges. Many of the kids I meet have also had very sad lives of abuse or neglect. Meeting someone special and "imperfect" like me can be very healing. I too have had a hard life and yet I provide hope and show that acceptance and love is still possible for them as it was for me. Thank you for reading my story and for supporting the powerful and healing work being done at SaveABunny. We rely on donations from the public to do our work and are volunteer-run. When people ask why should we rescue a special needs rabbit when there are so many healthy bunnies who also need homes, the answer is that SaveABunny was founded with the intention that EACH rabbit matters. SaveABunny balances special needs rescues with the rescue of adoptable rabbits and is dedicated to giving each and every rabbit the chance to know what it feels like to be loved and treasured. Many times the most wounded rabbits, like me and Phoenix, are the ones who are ultimately able to transcend our pasts and give back the most. Family dinner with the Late Bloomer Club -- Grace, Tej, and Scooter. Scooter continues to support his family.